The results are in! 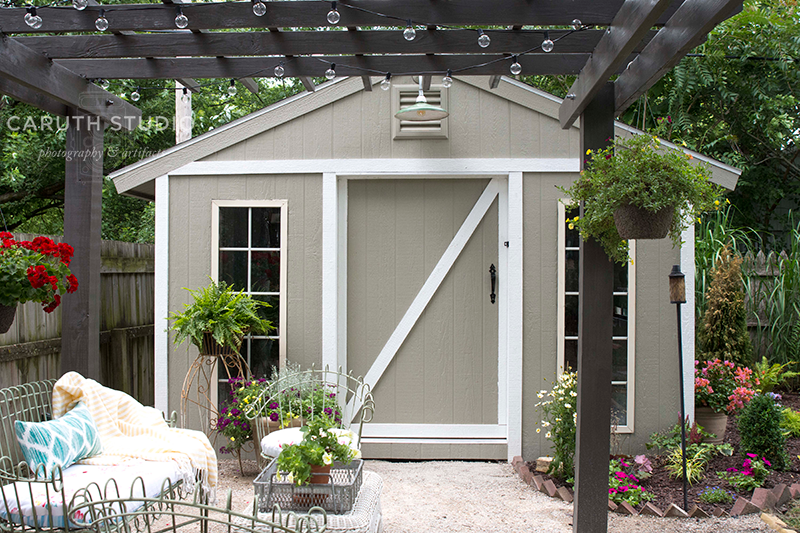 In partnership with Lowe’s Home Improvement Stores, we turned this lackluster backyard corner into a destination shed, patio, and garden. Narvas shows Hannah how to make a shutter from cedar fence pickets. See how we made them (you can also use salvaged pallet wood). While Hannah made the wide shutters for the shed, Kurtis makes two sets of smaller shutters for the garage to replace the delapidated plastic ones. Easy and affordable, a finished set of cedar shutters costs about $8 to make. We painted the shutters with Olympic Paint’s Elite Solid Stain in Creamy Dill. The color will help to tie the garage and shed together and the stain lets the texture of the wood show through. The shutters are attached on either side of the window with wood screws. We found two old enameled metal barn lampshades at a local vintage shop and decided they’d be ideal for matching exterior lights over the shed and the rear of the garage. Narvas is a whiz at this sort of thing so he’s pulled together a bunch of components to make the fixtures. Galvanized elbow conduit and threaded couplings will form the arm of the lamp. A vintage tin jello mold (10 cents!) will act as the pendant holder. Narvas drills a hole through the bottom of the mold and three more small holes around the rim to screw the mold to the shade. He runs a wired phenolic light socket through the conduit and adds the fittings. Before he connects the wiring, Narvas drills a hole in the gable above the vent. Then, he places the round electrical cover over the hole and drills holes for the screws so it’s easy to attach the fixture when all the wiring is complete. When the fixtures are assembled, Narvas inserts the wiring through both shed and garage gables to connect to electricity. With the electrical connection made, Narvas adjusts the tension of the wire so that the entire fixture is tightly assembled. When finished, he adds silicone to all the component connections to make the lamp weatherproof and inserts the bulbs. The matching lamps add another element that, like the color scheme, ties the old and new buildings together. While Narvas is fussing with electricity, Kurtis tries his hand at making a zinc tabletop. He starts with a 6-foot wood panel that’s cut down to about 54 inches. A 5-foot zinc sheet arrived rolled up in a box so Kurtis lays it out to allow the curve to settle. It’s covered with a protective film. Using Liquid Nails, Kurtis attaches the zinc sheet to the wood and weighs it down with just about any heavy thing he can get his hands on. While the adhesive dries, Kurtis uses a mallet to bend the zinc over the edge of the wood panel. He nails the zinc to the underside of the panel with large-head tacks. We made a support for the tabletop under the window at the rear of the garage. Three gate-fold legs made of straight and turned treated deck balusters are hinged to swing out and create a base for the tabletop. The top will be attached to the 2×4 screwed along the bottom the window frame. Both legs and 2×4 are stained to match the pergola (and incidentally, the zinc). Hannah crawls beneath the supported tabletop to screw in the hinges that attach the top to the supporting beam under the window frame. Narvas managed to strain his shoulder with all this stretching and lifting so when the table, his last construction component, was finished, a T-Rex high five was all he could manage with his arm in a sling. Hannah gives him another chance to get it right. The table will always be there for parties, potting, or crafting, ready for service with a lift and turn of the gate-fold legs. Bright yellow metal stools add a jolt of happy color to the table set. We found this vintage metal furniture set at a local antique shop and couldn’t resist the flirty look or the fabulous patina. We made cushions for our metal patio set using a vintage tablecloth. Cutting around small holes and trying to get the floral bunches placed well on the cushions was a challenge but our intrepid seamstress (thanks, Elaine!) managed it beautifully. An old wicker table got a new look with a fresh coat of antique white spray paint. An industrial metal mesh basket contains a potted plant and jug of water. The dining end of the patio features our flip-down serving table with stools and a vintage farm table with mismatched chairs for sit-down outdoor meals. Vintage tablecloths add color and pattern in our color scheme of yellow, teal, and red. Like that rolling planter box on the left? See how to make one here. A vintage wire plant stand elevates a Boston fern over a pot filled with Spanish lavender, purple verbena, lysimachia, and lemon yellow nemesia. The following are a selection of shots that take you from Before to After. What a difference some affordable construction materials, a can-do attitude, and serious elbow grease can make, right? This looks awesome!!!!! Great work guys! Thanks, Ascheley! It was a team effort!